Nodal Ninja Ultimate R20 Kit specifically for the Business program. This business kit is designed for use by photographers wishing to produce photography for the Business Program. £249.95 (£299.94 inc UK VAT) Including choice of lens ring. Nodal Ninja Ultimate NN6 New CNC Machined precision panorama head from Nodal Ninja. The Nodal Ninja NN6 Panorama Head with RD10 Advanced Rotator. £369.95 (£443.94 inc UK VAT). Nodal Ninja NN3 MK 3 The latest CNC Machined precision panorama head from Nodal Ninja. Nodal NInja VR Head, Rotator Mini, carrying pouches. £179.95 (£215.94 inc UK VAT). The ideal manual pano head for gigapixel high-resolution imaging using telephoto and super telephoto lenses. NEW MODEL: Nodal Ninja RS-1-NOR Ring Mount Spherical Pano Head Professional Lightweight VR head for use with the Nodal Ninja lens ring mounts. This new Nodal Ninja RS1 model is a multi-row ring mount spherical pano head, allowing zenith and nadir shots at the NPP (No-Parallax-Point) and makes stitching of multi-row pano an easy job. NEW MODEL: Nodal Ninja RS-2-NOR Ring Mount Spherical Pano Head Professional Lightweight VR head for use with the Nodal Ninja lens ring mounts. This model RS-2 is suitable for larger DSLR cameras. This new Nodal Ninja RS2 model is a multi-row ring mount spherical pano head, allowing zenith and nadir shots at the NPP (No-Parallax-Point) and makes stitching of multi-row pano an easy job. 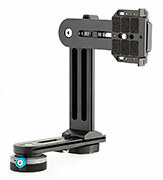 Nodal Ninja Ultimate R1 Adjustable Tilt Ring Mount Panorama Head available with the NEW RD5 Advanced Rotator Base. The R1 pano head incorporates a unique cantilever tilting options suitable for different fisheye lens on different sensor formats under different applications. Add a ring clamp which mounts directly onto the lens itself freeing up the camera. Different cameras can be use on the same lens without adjusting any settings.